As can be easily observed this volume immediately presents itself for easy consultation. The works are listed according to the authors whose names stand out in the paging and are made evident by the print type. Abbreviations have been reduced to a minimum and all symbolism has been avoided to make everything more immediate and comprehensible. All information contained in this volume derives officially from the auction houses by means of the catalogues and results sheets which they publish. Only those works of known authors have been selected (in this trusting blindly the various auction house experts) and which have been actually sold. This is because an instrument, about which an expert may be in doubt, gets a quotation which cannot be of the standard or cannot be compared with the quotations on works of certain authenticity. Besides the effected sale guarantees the reader, and the public at large, a confirmation of the value of the piece. 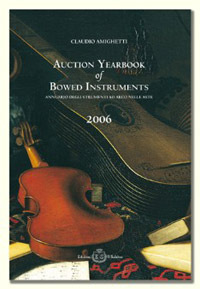 To enhance and complete the information the body length is included (or the weight in the case of bows) as well as the estimated price (in original currency), a brief description (referring those seeking more information to the official auction cataloque), certificate indications and photographs of some works. The sale price is expressed in the five principle currencies of the marketplace including also auction fees but without other taxed and taking into consideration the official bank exchange rates on the sale date (or the preceding working day if the sale took place on a Saturday or Sunday). For the year 2006 twelve auction houses have been taken into consideration, operating in five countries, giving a total of thirty actual sales. On the whole 1,231 instruments and 1,072 bows have been cataloqued.